I've just received notification from Ruth Churchill at CILT of some FREE resources available. Never one to look a gift horse ..., I immediately investigated! Apparently May 9th is Europe Day (I'm afraid this was the first I'd heard of it!) 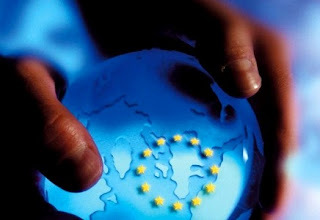 and the European Commission has produced a booklet to promote the day as well as provide information promoting the EU. What do we know about the member states of the European Union? Whereabouts is the statue with more clothes than one would find in any woman's wardrobe. Did they really use eggs to built a bridge in Prague? Could there still be an island where no female either human or animal is allowed? This and a lot more information on the 27 member countries of the European Union e.g. their size and population, famous citizens etc. is answered in our little booklet "Passport to the European Union" which also includes stickers of coins, flags, buildings and even a map. Children can find places for the stickers in the passport and on the map. In order to support Europe Day (9 May) activities for young people, the Representation of the European Commission in the United Kingdom is making 100,000 copies of the Passport to the European Union available to UK schools and similar organisations completely free of charge. So don't hang around- there are now 100 less copies as my order's already in! Here's a montage of posters used in previous years to promote the day - perhaps it'll inspire you! To find out what's going on in the UK, have a look at the events diary - I like the look of the Giant European Union Pub Quiz in Wrexham! And there's also a whole page of ideas for how your school might be able to celebrate.